Φακές (FaKEs) means lentils and σούπα (SOUpah) means soup. 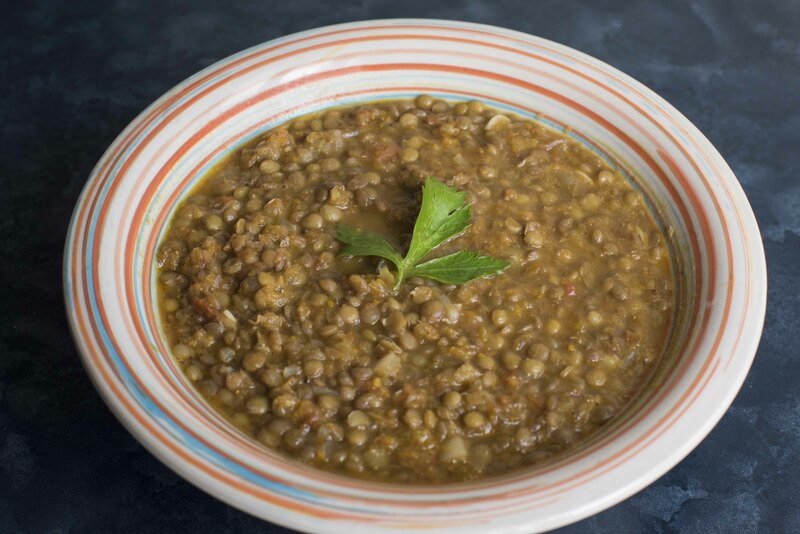 Lentil soup is a very traditional dish and my husband thinks it makes him strong! My husband likes to refer to the soup by saying φακές but I’m not sure if it’s a Greek thing or just his thing. A few times after days of too much meat (I almost never cook meat but we went through periods of eating out too much and the current Greek diet is full of meat dish), he declared he wanted a whole week of only φακές. The longest he stuck to his request was three days for both lunch and dinner. Well, he tried. My recipe here is probably not that traditional. If you are not used to traditional Greek cuisine, you might be shocked when you are offered a really traditional bowl of φακές like I was – it is full of oil! It is yummy but I disagree that it is good for health, not that amount. So over the years I change the ingredients a bit and also the way to make it. I saw many recipes that said cook the onion etc in olive oil and I used to do this way. Later I found this Greek cookery book by an Australian (I’m really sorry but I can’t recall her name nor the title of the book. If you know, please tell me.) who married a Greek man and she learnt how to cook from her grandmother-in-law who lived in a village in Greece. She first boiled all ingredients in a pot and added oil only at the end. I employed her method ever since because it is so much easier and the olive oil retain its taste and healthy property. One thing you must remember is that you must not put salt until the very end because otherwise the φακές would not become soft. So, here goes my not so traditional Φακές Σούπα! Laurel leaves – 3 dried ones. Fresh leaves are of course okay! – Buy lentils that do not require washing or cleaning. My husband bought some organic ones from a farm once and even after 2 hours of picking up impurities, we still had sand in the soup! – Laurel leaf in Greek is Δάφνη (Daphne). I’m not sure why though that some people translate it to bay leaf. I used to call it bay leaf as well until I gave some to a friend in London who had a bay tree and she exclaimed how the leaves looked so different. You can use this leaf for many dishes like soup and stews. It’s supposed to eliminate some sort of bacteria and in general good for you. – You can sprinkle oregano on everything and it becomes a Greek dish (joke)! It gives a nice fragrance and is supposed to be good for health. 1. Peel the onion, garlic and carrot. Chop or slice the onion and garlic. Shred the carrot with a box cutter. I don’t have a box cutter right now so I chopped it in a mini chopper. 2. Prepare the tomatoes. You can roughly chop them up or use a mini chopper to do the job for you if you don’t mind the skin. If you don’t want the skin, you can do the Greek way – cut the tomatoes in halves width-wise and grate them using a box cutter resting on a bowl to catch all the juice, discard the skins. 3. 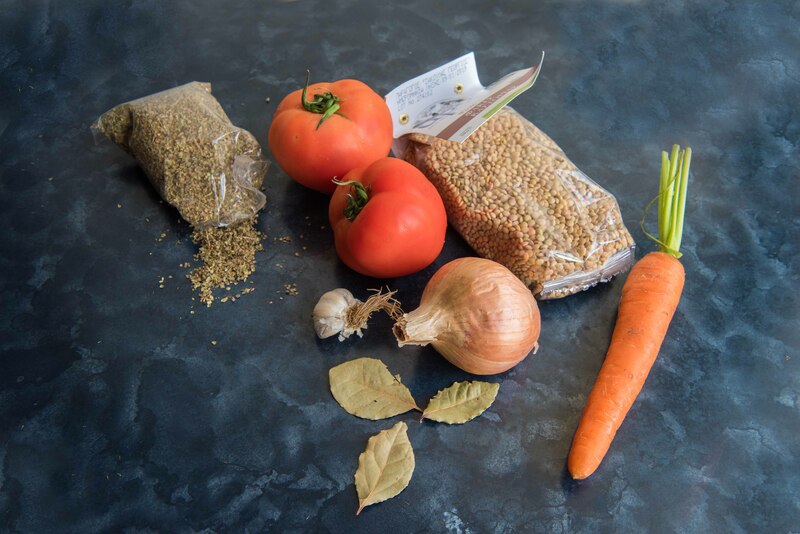 Put the onion, garlic, carrot, tomatoes, lentils, laurel leaves and oregano into a large pot and cover everything with water. The ratio of lentil to water is about 1 to 3. 4. Heat till it boils then lower the heat to medium low and boil till the lentils are soft. This could be between 20 to 40 minutes, depends on the lentils you have. 5. When the lentils are cooked to the softness you like, add salt (about 1 tsp but please do taste it), little bit of black pepper and as much olive oil as you like. The lentil soup I had at Greek friend’s home has a whole layer of oil in it. I usually use a few tablespoons and let my husband add more himself if he feels like it. 7. I like to use a hand blender to blend the soup a little bit so as to make it a bit mushy. If you would like to do this, remember to take out the laurel leaves first. 1. Crumble some feta cheese on top when you serve. My husband loves this and he reminded me to tell you. 2. Sprinkle some chopped parsley. 3. Add a dash of vinegar. I saw my father-in-law did this (he used red wine vinegar) and read that it’s a traditional thing to do. Images by my husband the Photoman.